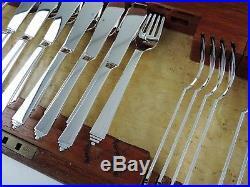 99 Piece Sterling Silver Pyramid Pattern Dining Service by Georg Jensen. Pyramid Pattern (8 place settings). 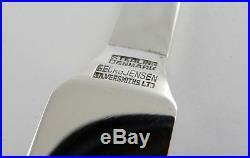 Post-1945 Georg Jensen Sterling Silver workshop marks: “STERLING DENMARK GEORG JENSENS SILVERSMITHS LTD”. 3070 grams (98.7 troy ounces) + 27 knives with stainless steel blades. 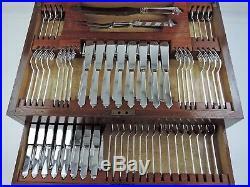 We are pleased to be offering this superb quality boxed 99 piece dining service of silver flatware and cutlery in probably the most sought after of all the Art Deco patterns. It is presented in an outstanding quality wooden box that is probably one of the most pleasing designs that we have encountered (see below for further details). 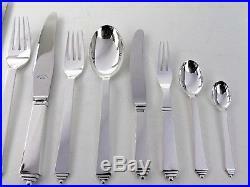 The service provides for twelve pieces suitable for use with up to five courses and enough settings for eight people. All pieces were made by the famous Danish silversmith Georg Jensen and bear his Sterling silver workshop marks. The number of different pieces within this canteen allows for greater flexibility in choosing how to use the service. For example, there are four types of knife: the fish knives have silver blades and the table, cheese/dessert and tea/side knives have silver handles with stainless steel blades to enable good cutting. The service appears to have been little used with the silver appearing near mint and just a little staining to the exterior of the box. Georg Jensen was a Danish silversmith who opened his first silver workshop in 1904 in Copenhagen. He was to become the most renown maker of silverware in the World with shops in London, Paris, New York, Berlin and Stockholm. His company embraced the Art Deco movement of the 1920s and 30s and some of his most important patterns were designed during this period. 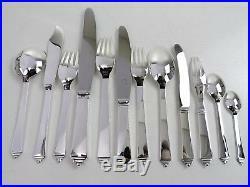 Many of the Jensen flatware patterns have endured the test of time and remain highly popular today. This pattern was designed for Georg Jensen by Harald Nielsen in 1926 and has a stepped terminal and streamlined shape typical of the Art Deco period. The pattern has continued to be manufactured by Georg Jensen and pieces fit well with the originals of the Art Deco period allowing further expansion of the service should it be necessary. This 99-piece service consists of the following. 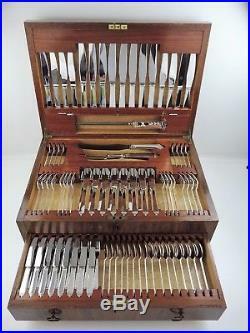 3 piece Carving Set. Total weight of weighable silver 3070grams (98.7 troy ounces) plus 27 silver handled knives/carvers with stainless steel blades. Excellent polished condition throughout as though it has barely been used. There are no personalised engravings. The box is excellent too with just some very minor staining to the exterior. This canteen is supplied in its original wooden box. The box is superbly made with each piece individually fitted see close-up photo showing how the wood has been cut to match the shape of the stepped terminals never seen that before! 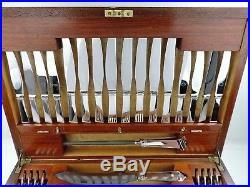 , plus the knife holders in the cover are far superior than the standard way this was done – the drop-down flap that releases the knives is both wooden and hinged. The box is a work of art in itself. All of our antique and second-hand canteens of silver are thoroughly cleaned, polished and checked before being offered for sale. We guarantee that you will receive exactly what you expect, in good order throughout and in a timely and professional manner. Your complete satisfaction matters to us and we shall do our utmost to achieve this goal. 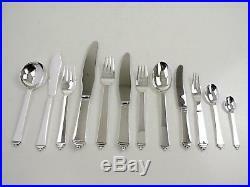 We have been dealing in antique silver for 25 years and are specialist dealers in silver flatware. 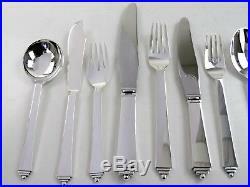 We have a huge stock of silver canteens of cutlery to suit all requirements and budgets. Here is a quick summary of what we have available. All standard British flatware patterns are available from the plainer services such as Old English, Fiddle & Rattail through restrained decoration, for example Bead, Fiddle& Thread & Dubarry and the ornate premier patterns like Kings, Queens & Fiddle, Thread & Shell. We have a stock of approximately 30 different patterns. Antique hand-wrought London made services to modern Sheffield made canteens and everything in between. All in hallmarked Sterling silver. From small services for 4, 6 or 8 place settings, full services for 12 and even double, triple and large number bespoke services to suit your exact requirements. A large selection available to complement your canteen. We have boxed sets, loose sets or sets within cutlery rolls. We are specialist dealers and generally supply the silver retail trade. Without the burden of High Street costs we can offer our canteens at wholesale prices? Without any loss in quality to either product or the service provided. You can be assured of a professional and friendly service and will never be disappointed with. Quality Silver – Sensible Prices. The item “GEORG JENSEN Boxed PYRAMID STERLING SILVER CANTEEN CUTLERY SET Art Deco service” is in sale since Monday, November 26, 2018. 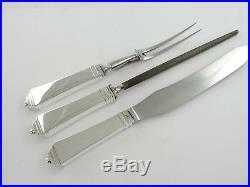 This item is in the category “Antiques\Silver\Solid Silver\Cutlery”. 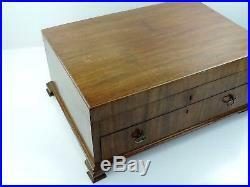 The seller is “sunbeau” and is located in Royal Forest of Dean. This item can be shipped worldwide.